"Killing 99.9% of cold and flu viruses in the tissue – all in a day’s work for Kleenex Anti-Viral Men"
Astute Staffing were proud to provide their Brand Ambassadors for Kleenex activity in Dublin recently. 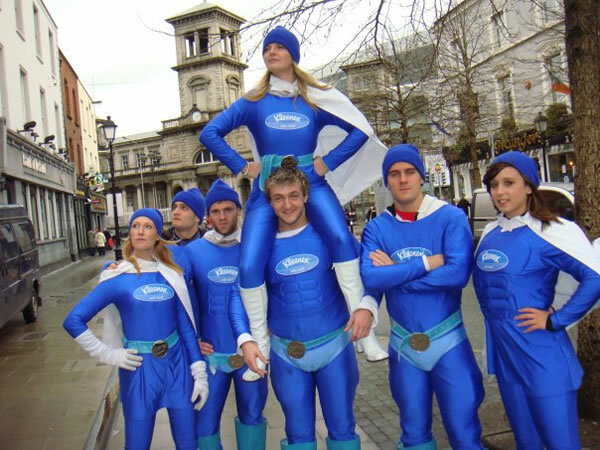 Staff dressed as a superhero "Antiviral Man" and helped to distribute Anti-Viral pocket packs and coupon leaflets to commuters, along with key brand messages. "Staff did a 'Super' job in distributing 30,000 Kleenex® Anti Viral pocket packs with a leaflet including a money off coupon at Boots, to as many commuters as possible over the course of a two day activity. Helping to build awareness and drive sales." The staff received fantastic feedback from passers by who were delighted with their complimentary sample and money off coupon! Remember next time when Kleenex Antiviral Man isn't around to protect you always use Kleenex Anti-Viral tissues. Three packs of KLEENEX® are sold every second in the UK! !